I recently discovered The Baby Cubby, an incredible shop based in Utah that's mission, as a mom, really speaks to me. They exist not only as a retail outlet but as a resource to for parents - whether it's through their community blog or store or social media - to help guide us through all of the ins and outs of parenthood. The Baby Cubby is for every parent out there who has ever felt overwhelmed or discouraged about becoming a parent (hello, yes!). And the Baby Cubby team is made up of parents who have been there, who know what it’s like and who are passionate about encouraging, inspiring, and reminding parents how amazing they are and how important their roles are in their children's lives. The way they do that is by finding the best and safest baby gear and providing it to parents in a fun shopping experience (like stroller testing on a stroller track! and price match Amazon!). And by offering an incredible blog where parents can read about important topics that come up for all parents throughout the parenting journey (like protecting your children from predators, finding time for yourself and dealing with low libido postpartum - seriously important topics). The level of care and thought that goes into the resources they provide is really incredible to see. Honestly, read what they believe and try not to get chills and smile from ear-to-ear. 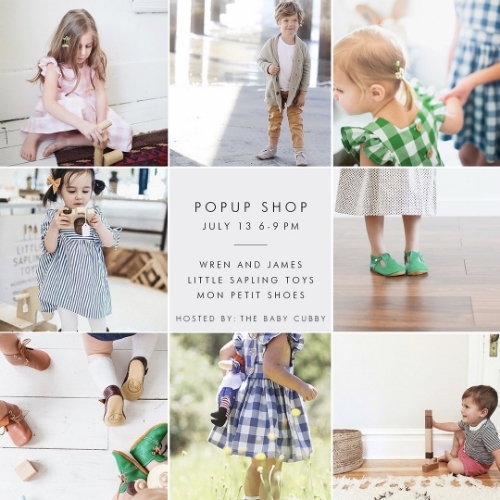 So when I found out they were hosting a pop-up shop with some of my favorite brands: Little Sapling Toys (you know my love for them runs deep), Mon Petit Shoes and Wren and James, I just had to share for anyone out West. Some favorite Little Sapling Toys. Noam playing with his wooden drum. Attendees will enjoy great company, fabulous deals, and delicious treats, as well as in-store giveaways, exclusive discounts and 10% off storewide. I really wish I were closer and able to go (and that Baby Cubby would open an east coast outpost!). But if you're nearby, clear your schedule and stop by!